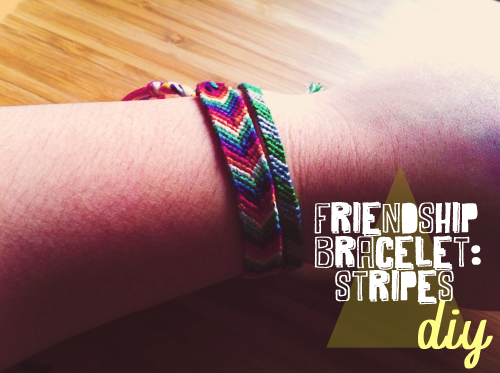 Chances Are: DIY: Friendship Bracelet - Stripes. This is my first DIY post! I love friendship bracelets. You can make so many different color combinations and designs and it adds some fun to any outfit. Being the stripes and Harry Potter lover that I am, I decided to show you how to make a candy stripe friendship bracelet using Slytherin inspired colors. Let's get started! 1) Measure the floss. Each strand should be at least 36 inches. That should be plenty. It may seem like a lot, but it's always good to have a bit extra than to not have enough string when it comes to friendship bracelets. I cut 6 pieces of string. 3 green, 3 gray. The more string you have, the wider your bracelet will be. 2) Measure out 4 inches. 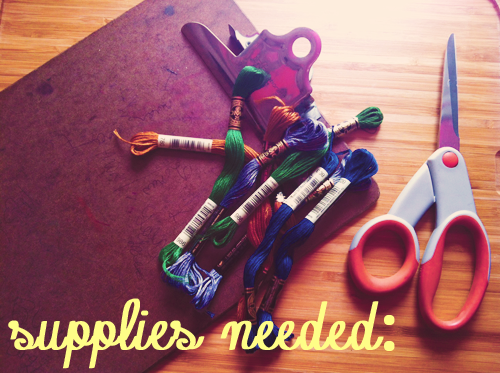 Take all of the string you cut and make sure they are all lined up together. Measure out 4 inches starting from the top. 3) Tie a knot. After measuring, tie a knot at the 4 inch mark. Tie it in a simple loop (shown in the image above). Leave it like that for now and clip it under the clipboard. I will show you what to do with the ends later on. 4) Lay out the string. After putting the knot under the clip of the clipboard, line up the string so it will be easy to see what you are doing. The way you line up your string makes up your pattern. In my bracelet, I lined up the 3 green strings first then I lined up the 3 gray strings. Therefore, in my bracelet I will have 3 green stripes then 3 gray stripes. It might be helpful to number each string starting from the left. For example: green 1, green 2, green 3, gray 1, gray 2, gray 3 OR 1, 2, 3, 4, 5, 6. 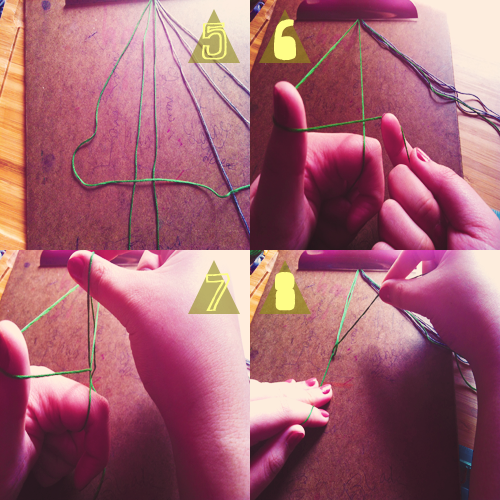 5) Prepare to make a 4-shaped knot on each separate string. This is where things get a little tricky. 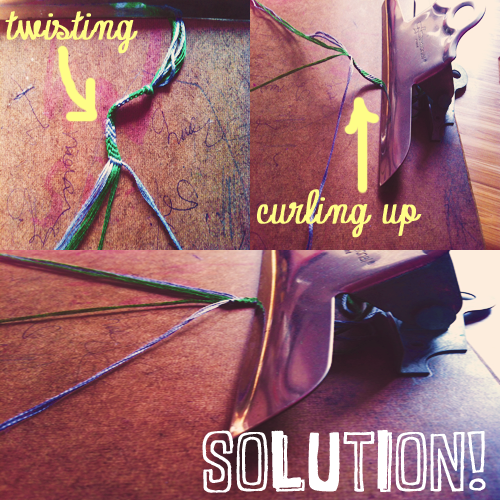 Make a 4-shaped knot on each individual string in the line you created. 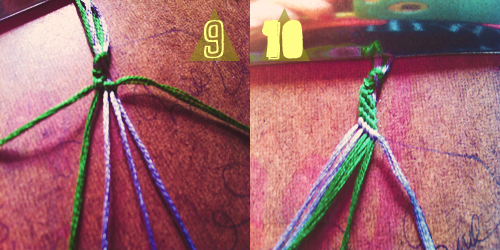 For example, on my bracelet, I have to knot the first green string twice. The second green string twice. The first gray string twice, etc. 2 4-shaped knots make 1 completed knot. This is very important. 6) Hold the string to make a 4-shaped knot. To make a 4-shaped knot, literally make a 4 out of the string. Start with the string the farthest on the left (string #1). Use that string to make a 4. Try to hold the string this way (shown above). It will make it easier. The string wrapped around my thumb is the string farthest to the left (string #1). The string I am gripping onto is the second green string (string #2). 7) Pull the string into the loop of the 4. Take string #1 and pull it through the hole that the 4 created. Hold string #2 still. The only string that should be moving is string #1. 8) Pull the string up towards the top knot. Once string #1 is through the loop, pull it in an upward motion. This is very important. If you don't pull it up, the bracelet will have gaps and holes and it won't look as pretty :( Make sure you pull it nice and tight. This will keep the bracelet looking neat and will prevent holes in the bracelet. Once you complete one 4-shaped knot, do another 4-shaped knot on that same string. 2 4-shaped knots for each string!! After completing 2 4-shaped knots, put string #2 aside on the left hand side. You won't be knotting with that string until you are done with the first row. 9) Repeat steps 6-8 on each string in the row. After making a 2 4-shaped knots on string #2, make 4-shaped knots on each string until you are done with the row. 2 4-shaped knots for each individual string. That means 2 4-shaped knots on string #3, #4, #5, and #6. This is what the first complete row should look like (shown above). 10) Continue to make 4-shaped knots until you reach the desired length of the bracelet. Is your bracelet giving you trouble? Is your bracelet twisting or curling up? I have a solution! Simply keep sliding your bracelet into the clip of the clipboard as your bracelet gets longer. Don't worry if your bracelet is twisting or curling up, that's normal! 11) Tie a knot at the end. When you've reached the desired length, make a knot similar to the knot you made in step 3. 12) Measure 4 inches at the end of your bracelet. This step is similar to step 2. 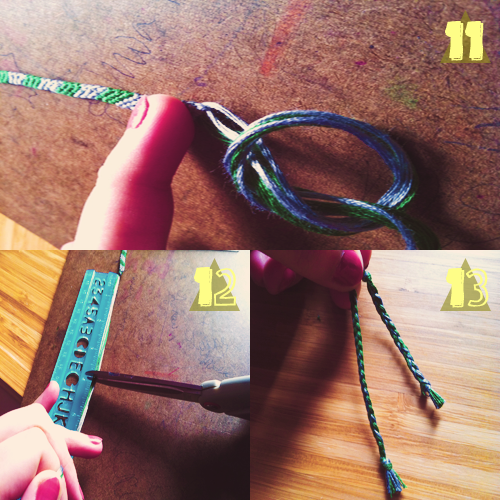 13) Braid the ends of the bracelet. You left off 4 inches on both ends so that you could have equal sized braids at either ends of your bracelet. 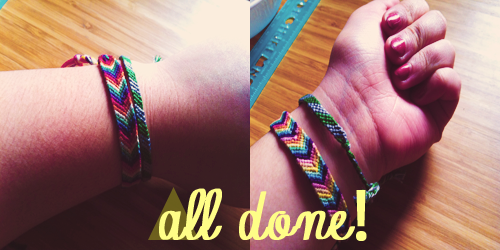 Braiding the ends gives your bracelet a nice, finishing look. To wear the bracelet, just tie the braided ends together in a knot. I hope my first DIY tutorial made sense. 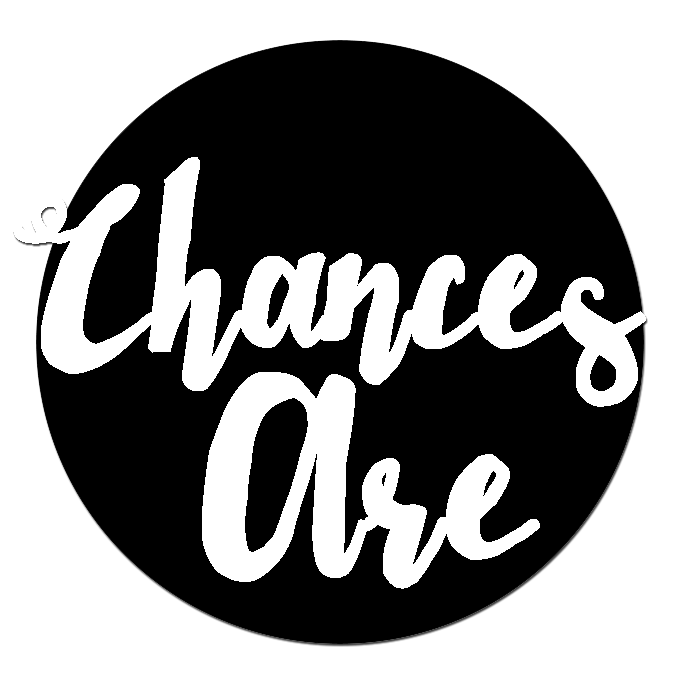 If you have any questions, leave a comment down below and I will help you out.